When consult with Dr. Goldschmidt at The Cosmetic Surgery Center, he will help you select the procedure that is best for you! In Cleveland, Ohio, Dr. Matt Goldschmidt is able to enhance facial beauty in just a matter of minutes. Using carefully hidden incisions, Dr. Goldschmidt, a board certified cosmetic surgeon is able to gently place facial implants to augment and accent your anatomy. The most popular implants are used to provide more fullness in the cheek (malar) region and to augment the chin to strengthen the jaw line. Both implants may be used alone or in combination with other facial cosmetic surgery. When consult with Dr. Goldschmidt at The Cosmetic Surgery Center, he will help you select the procedure that is best for you! Cheek implants also known as Malar Implants are used by plastic and cosmetic surgeons to restore the foundations of the midface that helps to rejuvenate your appearance. While there are many other methods used to emphasize cheekbones, there are advantages to using implants over a fat transfer, injectable fillers, and other lifting methods. They will provide a permanence that is unmatched. The other options tend to last only a few years and then need to be repeated. They are less invasive but may only be a temporary solution. The most popular implants are made with silicone and feel and look very natural, so you don’t have to worry about discomfort or an artificial appearance. The cheek or malar implant can easily be removed by a cosmetic surgeon in Cleveland, Ohio if they become problematic or if the patient wishes them to be removed. There are implants designed to augment specific areas of the cheek and midface region. The most popular styles of cheek implants include submalar, malar, and combined submalar. Dr. Goldschmidt, a board-certified cosmetic surgeon and his staff in Cleveland, Ohio will speak to you about which cheek (malar) implant fits your facial type the best, so you can get achieve beautiful facial harmony. While fat transfer and injectable facial fillers dissolve or melt away over time, cheek implants may last for many years. But remember, Dr. Goldschmidt will be happy to remove them at any time if you decide you don’t want them anymore. The procedure is performed under anesthesia or twilight anesthesia. The placement of cheek implants takes under an hour and the implants are secured with Tiny screws to prevent the implants from moving around. The recovery time varies depending on the level of swelling. While some patients are able to get back into their routine within a few days, some patients may need a little more time. Implants to accent your lower face are commonly used in plastic and cosmetic surgery in Cleveland, Ohio. A prominent chin is a sign of strength and may also help shape your jawline and neck. A chin implant (mentoplasty) may be easily placed and secured to the jaw bone to help achieve this goal. As we age, bone can melt away (resorb) and lead to loss of support of the overlying skin. 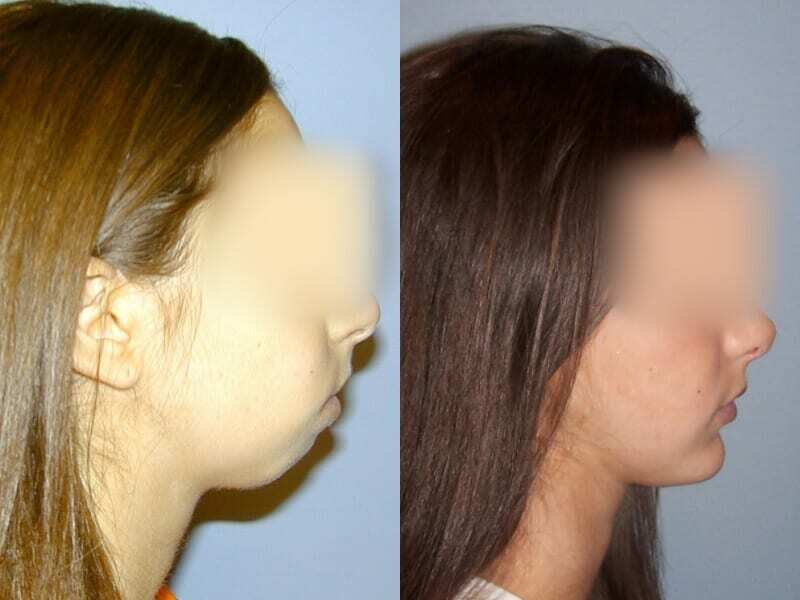 Some patients are born without a sufficient, strong chin. Other patients may need to enhance their chin to create facial harmony. For example, some patients may have a prominent nose they wish to be less noticeable. Dr. Goldschmidt and his staff may recommend a rhinoplasty (aesthetic nose surgery) and a chin implant to help produce the ideal result. Liposuction of the neck (submental liposuction) is also commonly performed especially at the time of a facelift to help support the overlying tissues. This also serves to not only sculpt the neck and produce a beautiful jawline, but it also rejuvenates the lower face and neck. The surgical procedure of placing a chin implant is relatively simple and can be done in under an hour. Most patients choose to be sedated or have anesthesia to be comfortable and less anxious, The procedure is often combined with other procedures to obtain the best result possible. The implant is made of solid silicone and has a very natural feel and appearance. A small incision in the crease under the chin is made and the implant is easily inserted in this fashion. The implant is then secured to the chin and jaw bone to prevent the implant from moving or rotating. Most patients recover within a few days to a week and will wear a special bandage during this time. For more information about Facial Implants or to schedule your Facial Implants consultation with Dr. Matt Goldschmidt, please call (216) 350-3175.